The aim of the present study was to evaluate the esthetic and functional outcomes after surgical excision of nonmelanomatous malignant lesions of the face, followed by a suitable tool of reconstruction. Neoplasm of the skin is found most often on the face. Cosmetically, the face is the most important anatomic area for most patients. Because of this, malignant tumors of the facial skin pose a great challenge in treatment, prohibiting compromises between oncologically responsible surgery and functional and cosmetic outcomes. This prospective study included 25 patients, all of them suffering from nonmelanomatous skin cancer and managed at Menoufia University Hospitals and Damanhur Oncology Center by different modalities of reconstruction during the period from April 2012 to December 2014. The appropriate technique was selected for every patient, taking in consideration the location and size of the lesion. 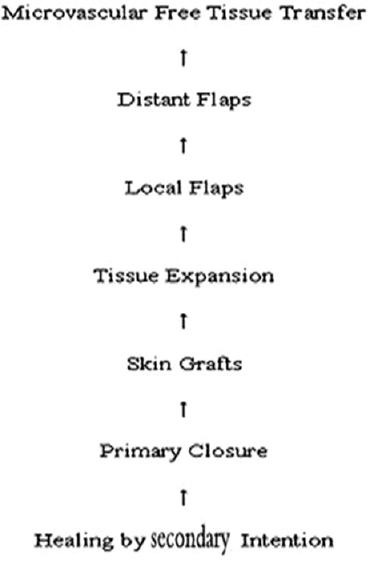 Eighteen cases had reconstructive procedures with local flaps only, five cases had more combined reconstructive tools in the form of local flaps (rotational flaps) plus split-thickness graft to close the secondary defect, and two cases required reconstruction with a full-thickness graft. Our experience showed that the postoperative defects gave the best cosmetic results when reconstructed by using a nearby tissue, fulfilling all patient and surgeon expectations with a minimum rate of morbidity. Clear guidelines and a multidisciplinary approach for the treatment of skin cancer are important to ensure that patients receive optimal care with satisfactory end results for tumor control as well as reconstructive esthetic outcome. Basal cell carcinoma (BCC) and squamous cell carcinoma (SCC) constitute the majority of nonmelanomatos skin cancers (NMSCs), and it is estimated that together they are responsible for more than one million cases annually. BCC is four to five times more common than SCC . The development of NMSC is multifactorial and is related to genotypic, phenotypic, and environmental risk factors. Ultraviolet solar radiation is considered to be the dominant risk factor for the development of NMSC, supported by the fact that most of these tumors tend to present on sun-exposed areas of the body. The development of BCC is thought to arise from intense intermittent sun exposure, whereas SCC appears to be linked to the cumulative dose of ultraviolet solar radiation over time . Reconstruction of facial defects is a challenging endeavor. Successful reconstruction requires a thorough understanding of skin anatomy and physiology, careful analysis of the defect, thoughtful consideration of multiple options for donor tissue, and skillful and meticulous soft-tissue handling techniques . Reconstructive surgeons use the concept of a 'reconstructive ladder' [Figure 1] . The more problematic the wound, the higher up the ladder the surgeon has to climb. Simple wounds may be closed by using primary suturing, sometimes in the primary care setting. But other wounds may require complex reconstruction including free tissue transfer . Figure 1: Reconstructive ladder in wound closure. This prospective study included 25 patients having NMSC who were being managed at Menoufia University Hospitals and Damanhur Oncology Center by using different tools of reconstructive surgery during the period from April 2012 to December 2014. Of the 25 patients, 16 were men and nine were women, with a mean age of more than 50 years (range: 40–80 years). The nose presented as the most common site for BCC of the face (40%), and the lower lip presented as the most common site for SCC of the face (75%). After obtaining an informed consent, the patients were subjected to complete history (to participate in the study and publishing their photos in scientific research journal) taking and thorough clinical, radiological, and histopathological examinations (by using hematoxylin and eosin-stained sections): 15 patients were diagnosed as BCC, eight patients were diagnosed as SCC, and two patients were diagnosed as basosquamous cell carcinoma (BSCC). Patients with NMSC were classified according to the location of the lesion on the face. Nasal NMSC (six patients, 24% of the patients). Lower-lip SCC (six patients, 24% of the patients). Cheek NMSC (six patients, 24% of the patients). Forehead NMSC (three patients, 12% of the patients). Perioral NMSC (two patients, 8% of the patients). Chin region and inner canthus (one patient for each site, 4% of the patients). Preoperative planning is the most important aspect of a successful reconstruction. Although small defects may only require a single procedure, poor planning leads to complication that result in poor esthetic outcome. All cases were treated surgically by using the standard surgical excision, with standard surgical margin applied (usually 4 mm or more). All cases were reconstructed by using local flaps or skin graft or both. Different tools of reconstructive techniques were used in this study. For closure of the upper-lip defects, perialar crescentic advancement flaps were used. All patients with squamous or BSCC were scheduled for a routine follow-up of the neck nodes by using ultrasound examination for any suspected lymph node pathology every 3 months. If there was a suspected node, neck dissection was performed. 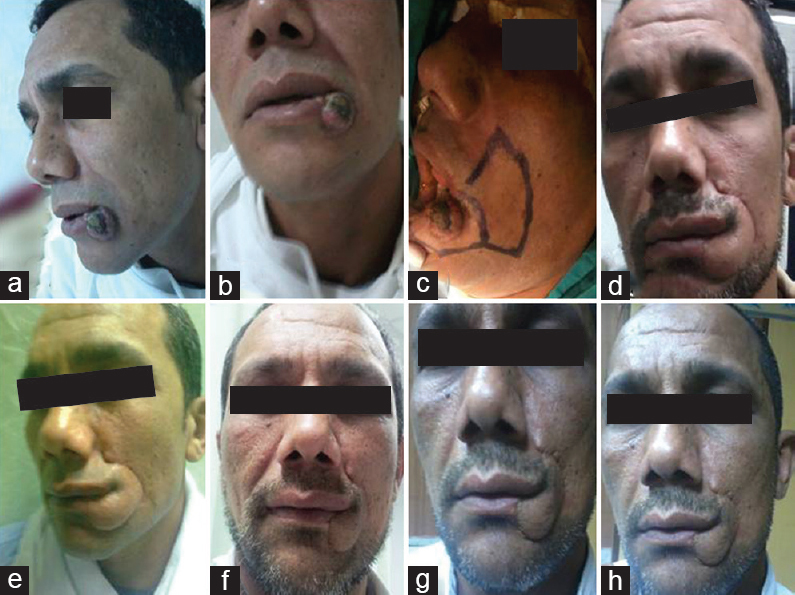 Twenty-five cases presented with cutaneous lesions on the face, 15 cases presented with BCC (60%), eight cases presented with SCC (32%), and two cases presented with BSCC (8%). The standard surgical excision with adequate safety margins according to the risk features of every lesion were used. 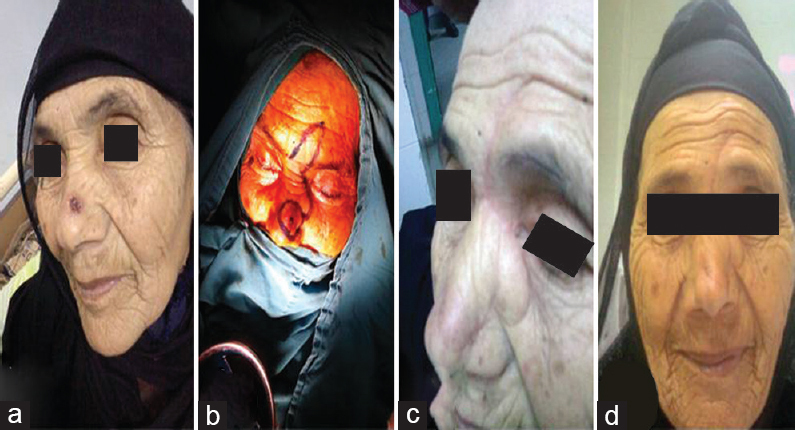 Different types of reconstructive tools, according to the character of the lesion (size, site, associated risk features, patient occupation, and desire), were used to cover the defects after surgical excision of the lesions. The nose presented as the most common site for BCC of the face (40%), and the lower-lip presented as the most common site for SCC of the face (75%). Clinically all patients were presented with a negative node on clinical and ultrasound examinations (78% sensitivity, 98% specificity, and 94% accuracy). BSCC presented with more aggressive tumors usually characterized with large size, progressive course, high recurrence rate, and increased incidence of lung deposits more than basal and SCC. There was an association between the long duration of the BCC and the presence of bone and other tissue infiltration: two patients presented with BCC for more than a year were found to be associated with infiltration of the underlying bone. All patients underwent surgical excision with a safety margin (4 mm or more) according to risk features of lesions. One patient underwent eye excentration because of the involvement of the frontal sinus and periocular fat. Safety margin was free in most patients (84%) of this study except four (16%); patients no further surgical management was done for them. All patients with involved margin were referred for radiotherapy for bone infiltration. Reconstruction was carried out either by local flaps or grafts or both according to the character of the lesion (size, site, associated risk features, patient occupation, and desire). Two patients were reconstructed by using full thickness grafts (taken from the postauricular area and the supraclavicular area), five patients were reconstructed using rotational flaps and split-thickness grafts for closure of secondary defect, and 18 patients were treated by using local flaps. 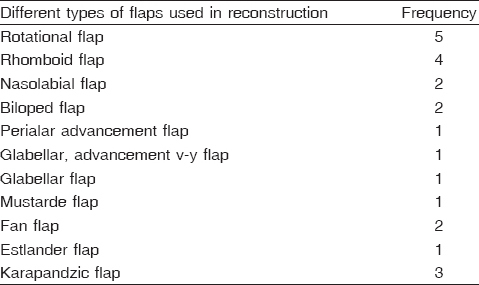 [Table 1] shows the different types of local flaps used in reconstruction. The esthetic results for the surgical procedures vary according to patient occupation, presence of complication, and loss of function and the need for postoperative procedures as shown in [Table 2]. Generally, the final esthetic results appeared after 3–6 months after the procedure. Esthetic results were deemed satisfactory by all patients and the surgeons. The color and texture matches were esthetically good. All scars were accepted. The follow-up period ranged from 4 to 18 months with a median of 13 months. Only three (12%) patients presented with recurrence. During the scheduled ultrasound follow-up, one patient presented with nodal infiltration in the submental group of the lymph node 3 months after the surgical excision of SCC of the lower-lip, and this patient underwent neck dissection. Two other patients presented with BSCC of the face: one presented with systemic manifestation in the form of multiple lung deposits and local recurrence after 8 months and was referred for chemotherapy; and the other patient in the form of intraparotid nodal infiltration after 10 months and underwent radical partiodectomy. The disease-free cumulative survival rate was 88.0% for the whole studied group [Figure 2],[Figure 3],[Figure 4],[Figure 5]. Figure 2: A 65-year-old female patient with nasal basal cell carcinoma treated by biloped flaps. (a) Lesion preoperative; (b) design of the flap; (c and d) patient postoperative (8 months). Figure 3: A 42-year-old male patient with BCC treated by perialar crescentic advancement flaps. (a) Lesion preoperative; (b) design of the flap; (c) patient postoperative frontal view (6 months); (d) patient postoperative lateral view (6 months). Figure 4: A 58-year-old male patient with BCC treated by using a full thickness graft. (a) Lesion preoperative; (b) defect after the removal of SCC, taking the graft; (c) after applying graft; (d) patient postoperative (12 months). Figure 5: A 42-year-old male patient with SCC of the lower lip treated by using fan flaps. (a and b) Lesion preoperative; (c) design of flap and closure of defect by fan flaps; (d) patient early postoperative; (e) patient postoperative (9 months); (f) patient postoperative (15 months). The face is one of the most common locations in skin cancer and frequently represents a significant challenge during reconstruction after surgical excision. Reconstruction of the defects created by the removal of cancer represents the secondary event in successful skin cancer treatment. Complete tumor extirpation – the primary event – is the key. The best reconstructive effort eventually fails in the face of tumor recurrence. Proper execution requires considerable technical skill and experience. Preoperative counseling is vitally important. In addition, a thorough understanding of the anatomy and aesthetics of skin is required . The criterion for surgical treatment depends on the size, depth, and location of the lesions. The aim is to excise the tumor radically with gross 4 mm free margins and to reconstruct the defect with the least cosmetic deformity, taking into consideration putting the line of resection in or parallel to the normal skin creases . Basal cell skin cancers almost never spread, but metastatic cases have been reported. If left untreated, it may grow into the surrounding areas and destroy the nearby tissues and bones ,. Although SCC is associated with a risk for nodal metastasis, significantly more than BCC, in the present study no nodal metastasis was found in SCC patients, clinically or radiologically. Ultrasound examination is needed to exclude this risk and for the follow-up of the patients; this is in agreement with the results of the present study, as two patients presented with nodal metastasis after surgical excision of the lesion during the follow-up period. BSCC has relatively low incidence compared with BCC and SCC, but it is presented in this study by progressive course and with an increased incidence of pulmonary metastasis compared with BCC and SCC, and thus computed tomography of chest is recommended for BSCC patients during the management and follow-up of the patients . Surgical excision with free safety margins offers the best cure rate in the management of NMSC. The size of the surgical margin depends on many factors such as tumor size, location, histopathological type, type of prior treatment, and number of recurrences. In the present study, a 0.4 cm margin was effective for the removal of BCC with a high cure rate provided the tumor was at a low-risk of having significant subclinical extension [well-defined, <2 cm in diameter, nonaggressive histology (superficial, nodular), located in a low or intermediate-risk area, and primary in the treatment status] . In this study, surgical excision proved to be a well-accepted treatment modality for SCC; lesions of less than 2 cm in diameter are best treated through excision, with margins of 4 mm, whereas the high-risk SCCs (these included the size of 2 cm or larger, histologic grade higher than 2, invasion of the subcutaneous tissue, and location in high-risk areas) require from 6 to 10 mm margins . The ideal for reconstruction must have a high degree of biocompatibility and produce little cellular or soft-tissue reaction. It should have a shape memory, and should promote tissue healing/re-epithelialization if it becomes exposed . Reconstruction of facial defects is a challenging endeavor. Successful reconstruction requires a thorough understanding of the skin anatomy and physiology, careful analysis of the defect, thoughtful consideration of multiple options for donor tissue, and skillful and meticulous soft-tissue handling techniques . In the present study, rotation flaps are well-suited for the closure of triangular-shaped defects, with one side of the triangle representing the advancing edge of the flap. Extensive areas of the face including the cheek and neck are amenable to the rotation flap closure. This is often the method of choice for the closure of scalp defects. Clear guidelines and a multidisciplinary approach for the treatment of skin cancer are important to ensure that patients receive optimal care with satisfactory end results for tumor control as well as reconstructive outcome . Even a perfectly designed and executed reconstructive surgery needs appropriate postoperative care and follow-up to optimize the final outcome. Informing patients that their cooperation with postoperative instructions will contribute to optimal cosmetic results tends to increase patient compliance . Appropriate follow-up after complete skin cancer excision has been discussed in several previous studies. Park et al. reported only a 1% recurrence rate after complete excision of BCC and suggested no follow-up for these patients. The national guidelines concur with this view unless a patient has had multiple previous lesions and is therefore at a high risk of developing further BCC (12 months risk of around 20% and a 5-year risk of 36%) . In this study, recurrence, either as nodal deposit (in two patients) or local recurrence, was found during the follow-up, with a 12% incidence of recurrence, which nesseciated a follow-up for patients. Herne K, Mortenson MM, Hymes SR, Cormier JN. Nonmelanoma skin cancer In: Feig BWeditor. MD Anderson surgical oncology handbook: Philadelphia, PA Lippincott Williams and Wilkins; 2012:153–164. Renner G. Reconstruction of the lip. Baker SR, Swanson NA, eds. Local Flaps in Facial Reconstruction. St Louis, Mo: Mosby-Year Book, Inc.; 1995. p. 345–396. Ge NN, McGuire JF, Dyson S, Chark D. Nonmelanoma skin cancer of the head and neck II: surgical treatment and reconstruction. Am J Otolaryngol 2009; 30:181–192. Boyce DE, Shokrollahi K. ABC wound healing (reconstructive surgery). BMJ 2006; 332:710. Rao J, Deora H. Surgical excision with forehead flap as single modality treatment for basal cell cancer of central face: single institutional experience of 50 cases. J Skin Cancer 2014; 2014:5. Akinci M, Aslan S, Markoç F, Cetin B, Cetin A. Metastatic basal cell carcinoma. Acta Chir Belg 2008; 108:269–272. Vu A, Laub D Jr. Metastatic basal cell carcinoma: a case report and review of the literature. Eplasty 2011; 11:ic8. Hiatt KM, Pashaei S, Smoller BR. Pathology of selected skin lesions of the head and neck In: Barners Leditor. Surgical pathology of the head and neck, 3rd ed. : New York, NY Informa Healthcare Inc.; 2009; 23:1475–1551. Hassan MI, El-Maleek Hassan DA. Reconstruction after removal of basal cell carcinoma. J Am Sci 2012; 8:42–49. El-Rashidy AL, Gharib F, Ragab A, Abd Elhafez TAE. Assessment of limited stage reconstruction of auricular deformities using autogenous costal cartilage. Menoufia Med J 2014; 27:490–496. Moolenburgh SE, Mclennan L, Levendag PC, Munte K, Scholtemeijer M, Hofer SO, Mureau MA Nasal reconstruction after malignant tumor resection. An algorithm for treatment. Plast Reconstr Surg 2010; 126:91-97. Salgarelli AC, Bellini P, Multinu A, Magnoni C, Francomano M, Fantini F, et al. Reconstruction of nasal skin cancer defects with local flaps. J Skin Cancer 2011; 2011:181093. Park AJ, Strick M, Watson JD. Basal cell carcinomas: do they need to be followed up? J R Coll Surg Edinb 1994; 39:109-111. Telfer NR, Colver GB, Morton CA. Guidelines for the management of basal cell carcinoma. Br J Dermatol 2008; 159:35-48.